Rattlesnake Arches is located in the McInnis Canyons National Conservation Area near Grand Junction, Colorado. A trail leads from the parking area across a mesa for a half mile where it descends to a bench that it uses to travel around the cliffs until it is above Rattlesnake Canyon. In short order a series of 8 arches that are spread out over the next 1.2 miles begin appearing in the rose colored entrada sandstone cliffs above the bench. There is another arch, Window Rock Tower/Aztec Arch, that is a half mile away from the point where the trail first reaches the bench that can also be visited on the same trip. The trailhead is only accessible from April 15 to February 15 unless the road is closed for some special reason. The Upper Road (10.1 miles) is shorter when it is open but it has a very steep hill that comes up right before it meets back up with the Lower Road (10.9 miles). Time wise it takes about 75 minutes from the when you leave the pavement to get to the trailhead driving at a speed that is easy on your vehicle. Under good conditions when the access roads are dry they only require a medium clearance vehicle until the last 2 miles or so where a high clearance vehicle becomes a must to get all the way to the trailhead. We have traveled the road in a jeep without ever putting it in 4-wheel drive but in our truck we have always engaged all 4 wheels just to keep from spinning our tires. We have seen people park a half mile or so away and begin hiking from there and we have also seen people mountain bike all the way from 16 1/2 Road. Of course, the other alternative is the 15.5 mile round trip hike from the Pollock Bench trailhead which can be done at anytime during the year. We highly recommend it to those that can handle its rigors. The trail starts out with a short descent where it heads northward toward the edge of the mesa. The trail reaches the edge of the mesa at the half mile point where there is a side trail that leads down to an overlook of Cedar Tree Arch. The sign is labeled First Arch, and it is the first arch that you come to, but maps typically have it labeled as Cedar Tree Arch. It is right at a half mile detour to the arch or 1 mile round trip. While we were taking pictures for this post someone came walking up the slickrock beneath the arch from the trail below. From below the arch you can see several moki steps to get started on but you better be sure you have good traction because it is a steep climb. After the 1 mile out and back to the Cedar Tree Arch overlook the main trail begins a moderately steep descent to get down to the bench below. There is some loose rock but other than that it isn't too bad. Once on the bench the trail meets up with the longer route that comes up from the Pollock Bench trailhead. From that point it is right at 1 mile around the base of the cliffs to where the trail turns up Rattlesnake Canyon and the arches begin appearing. The first main arch is called 'Hole in the Bridge'. There is a small unnamed arch to the left of it and a larger and more impressive arch to the right. We generally refer to them as the 'Left Side Arch' and the 'Right Side Arch' for a lack of better names. As the trail continues the next arch that appears is Eye Arch. Next up is Centennial Arch. 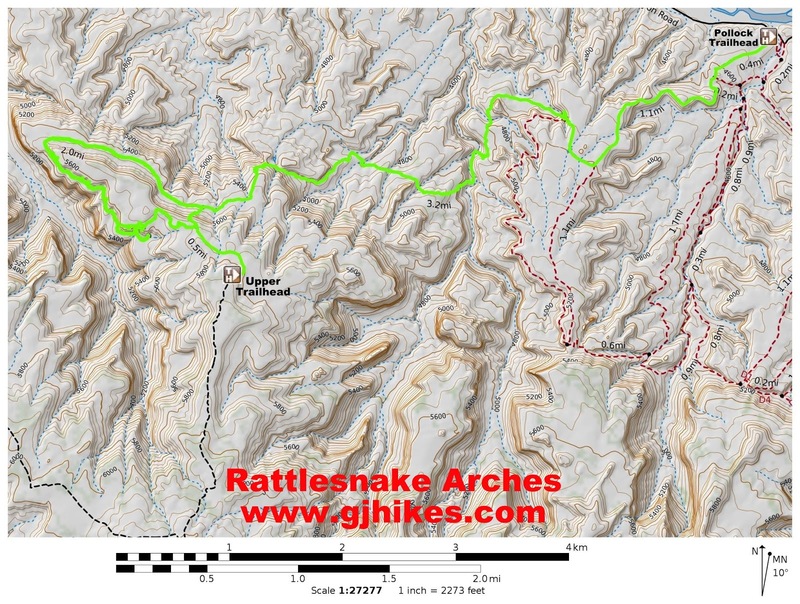 With a height of 120 feet and a span of 40 feet it is the granddaddy of the Rattlesnake Arches. After that the next arch is the Overhanging Arch. Continuing on around the base of the cliffs, and tucked neatly away in a short side canyon, is Trap Arch. The trail officially comes to an end at Cedar Tree Arch. From down here, if you are so inclined, you can shorten the hike by scaling the slickrock beneath the arch. For us, we simply turned around and returned the way that we came. On the way back we made a short climb up to take a picture of Eagle Rock. It was probably a lot more trouble than it was worth but its still pretty cool looking. We also detoured down the Pollock Bench route for a half mile to get a picture of Window Rock Tower, a.k.a. Aztec Arch. Most of these arches have more than one name. We have listed the geographic map name first when our maps had a reference for the arch. The detours to the First Arch Overlook and Window Rock Tower made the total round trip distance come out to 8.2 miles. That also included a few hundred feet of hiking down the trail that actually leads down into Rattlesnake Canyon to see how well traveled it was. It is one of the trails on our very long bucket list of everywhere else we would like to explore. 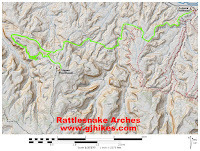 We get visitors from all around the world to the website on a daily basis looking for information on Rattlesnake Arches making it one of the most sought out destinations in the area. Having been there multiple times its easy to see what all the fuss is about. If you would like to see it for yourself then all you have to do is 'Take a hike'.